Burnley Football Club have today announced the signing of striker George Green until the summer of 2016. 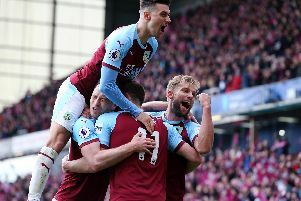 The former Everton and Oldham Athletic youngster, a free agent, signs a six-month deal at Turf Moor after impressing on trial. Green, 20, scored a hat-trick for the Development Squad in a training match against Loughborough University earlier this month. And the Bradford-born forward is delighted to have joined the Clarets. Green said: “I’m delighted to have signed at Burnley and I just can’t wait to get going. “The six-month contract is a great platform for me to start from, to knuckle down, work hard and hopefully that can reward me with a long-term future at Burnley. “My aim in that time is to just impress and prove myself to everyone, and that’s all down to me now. “But I know that won’t come easy, I know the nature of the club is to always work your hardest, and I will do just that. He added: “I’ve got Football League experience under my belt already, but I want to play at a higher level than League One and I will do my best to try break through to this first team. “I’m a number 10 who doesn’t shy away from games. I like to get on the ball as much as possible, make things happen and do everything I can for my team to win games. The highly rated forward, who joined Everton from Bradford City in 2011, will link up with the Development Squad, and Senior Professional Development Phase Coach Michael Jolley is delighted to have George on board. Jolley said: “George is a very talented player with a lot of potential and I believe he will only get better in our group of players. “In the two games he has had for us on trial you can see how much talent he has and he certainly catches the eye.